Shirdi Sai Baba Stories,Leelas and Teachings. : Ram Vijaya-Chapter 59. Today I am uploading the concluding chapter( 59th)of Ram Vijaya. I would like to thank the Sai sevaks behind this divine task who were inspired by Baba to bring this blessed work for all the devotees. I received a lot of mails thanking for uploading the book as many devotees had deep desire of reading this book and were searching for it for a long time. Many devotees are performing saptah(parayan) of this book by reading each chapter on daily basis and wish to restart their 14 days parayan after the complete book is published in the website . I am deeply indebted to Jayaram uncle and Sankar Kumar uncle for providing the English and Tamil versions of "Ram Vijaya" for the benefit of all Sai devotees.It is Baba who inspired His these sevak and now we all are blessed to get this divine nectar. I would also like to let the readers to know that very soon we will publish this complete book in PDF format so that devotees easily can download and print it for their personal use and benefit from the divine blessing of reading or doing 14 days parayan of the revered book "Ram Vijaya". In the end of the 59th chapter there is a small note by Jayaram uncle and Shankar Kumar uncle and I would like thank them for their kind words, which I lay at the feet of Baba .Baba is the doer and He is the controller .I pray to Baba to shower His blessing on one and all and pray to let His seva continue with same devotion and faith .May Baba bless His sevak who are associated with the website and helping this work progress and grow each day . Thank you Jayaram Uncle,Sankar Kumar uncle ,Sister Asha latha ,Sister Ramya ,Kowushigan ji and many annonymous devotees who I know personally . It my humble request to Sai devotees ,if they have any such revered work like Ram Vijaya and other religious books as mentioned in Sai Satcharitra with them ,please do share with us and all the devotees across the globe .Readers are welcome to write their experience of reading Ram Vijaya,views and suggestion below this chapter in comment box .Those who have missed out any chapter can read them by clicking on the link provided below this chapter . Jai Sai Ram. This news having been communicated to Rama, the latter mounted his chariot and personally came to the field of the war with the army of the monkeys. The monkeys threw at the boys mountains, rocks and trees which they broke with their weapons and killed many monkey-warriors, and some monkeys fled for fear of life. At this time Maruti jumped into the air to lift up the boys with his tail but Kusha, perceiving his intention, let off a power ful arrow at him, which struck the monkey and brought him down. Kusha loudly said " Oh ! ugly monkey. You destroyed the Asoka forest but here you cannot do any thing. The throwing of stones and mountains at demons was not a war. There is no Dronagiri here. You jumped over the sea and burnt Lanka. There is nothing like that here." In the meantime, Sugriva threw trees at the boys but Laliu cut them off, and made Sngriva, Nila,- Jambuyant,- Angad and Maruti and other monkeys insensible. Looking at this defeat Rama let off arows at the two boys which the latter cut off and let off innumerable arrows, which scattered throughout the sky without hurting Rama. Looking at the bravery of the boys Rama asked, "Children of the Rishis, listen to me, I shall give you what you want. I shall give you a cow, which will give you milk. I am pleased with you and will give you whatever you want." " We want nothing from you," replied the boys, " but on the contrary we will give you whatever you want. You can enjoy your own wealth. We have heard enough of you. You are such a heartless and cruel man that no one like you can be found on this earth. Sita, an innocent woman of virtue, you left alone in the forest. This is most wicked on yonr part "
Listening to what they had said, Rama was moved with affection for them and thought of stroking their heads with tenderness. But the boys told him to continue fighting with them. " Just tell me," said Rama, " Who you are, who your parents are, which guru gave, you education, who taught you dhanur-vidya, science, arts and mantras?" The boys heartily laughed and said, " This man does not feel for his brothers. He wants us to tell him stories. Sir, first fight with us and then ask us stories. You have killed Havana and done many brave acts. Now let us see a little of it. We shall never allow you to depart from this place without fighting with us. If you cannot fight with us, return home quietly or be a sanyasi [Ascetic], because you have neither wife, nor children." he fell down insensible. Kusha came up to him and, taking off his mugut, put it on his own head. Lahu stripped Lakshuman of his ornaments and wore them himself. Having done this, they mounted the chariot of Rama and tying up Maruti, Sugriva, Angad, Jambuvant and other monkeys to the chariot for the amusement of their mother, drove to their abode. They told Sita that they had made Rama and his brothers insensible in the field of war and killed all their warriors. " Here are the monkeys," said they, " we have brought for your amusement." Sita knew them and did not come out, because they might feel ashamed of their state. She said to her sons, " Let the monkeys go away. We shall never keep them here." The boys then went arid untied them. The monkeys came and informed Rama of what they had seen. In the meantime, Valmika returned from Patal ; and, having been informed of what had happened, he went and brought all the warriors to life by sprinkling water over them from his Kamandalu [The water pot used by an ascetic and religious student]. The Rishi then gave the two boys and Sita in charge of Rama, who heartily embraced them. 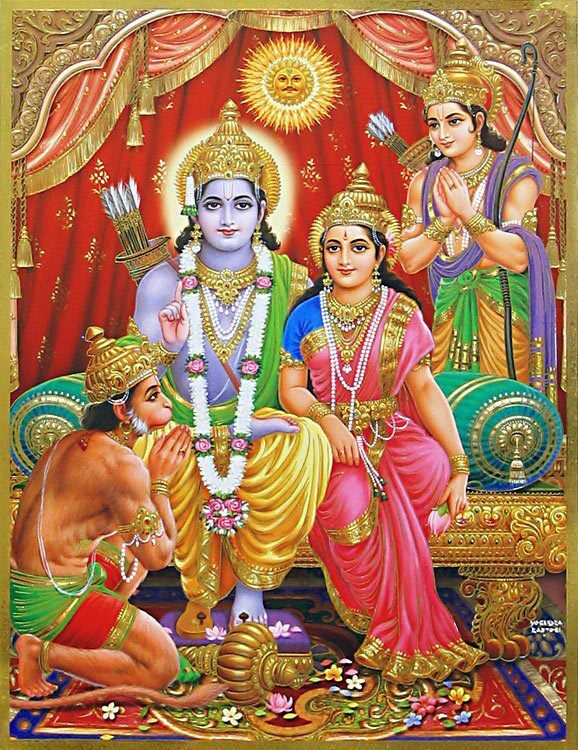 Shortly after, Rama took leave of Valmika and returned to Ayodya with his sons and completed the ashwamedha. 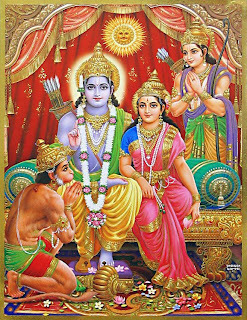 Sri Ram Jai Ram Jai Jai Ram! My sincere thanks to Samartha Sadhguru Sri Sainath for showering HIS Grace to complete the translation of this great epic. I cannot thank enough Manisha'ji and Jayaraman'ji for their zeal in bringing this out on a regular basis and to all the Sai devotees who patiently read this charitra. Sri Sachchiudhanandha Sathguru Sainath Maharaj ki Jai! There is a saying in Tamil. ‘More you dig a gold mine, more that you get gold’. This is an apt adage that flashed in my mind when I was uploading Shri Sankarkumar’s translated work of Rama Vijaya. In this connection I would like to unravel an interesting background before I compliment Shri Sankarkumar and Manisha. Shri Sankarkumar’s entry into this blogger was as accidental as that of mine. In the year 2009, I accidentally fell into the net of energetic house wife Manisha who was in Tanzania . She was maintaining three Sai Baba sites in English, and with an intention to peacefully spend my retired life, I expressed my desire to get the Sai experiences translated into Tamil for her blogger. I approached her on 7th Sep 2009 by Email. In few days I was imprisoned into Sai word by Manisha, our daughter like sweet girl, (as me and my wife affectionately call her) and from then on she quite often interacted with me and discussed the contents and others aspects of the Tamil blogger and one fine morning quickly and quietly she inaugurated the Tamil Blogger which carried my translated articles taken from Sai Services. It began with the biography of Pujyashri Narasimma Swamiji. In a short span of time the new Tamil blogger took off and continued its journey in full stream with several translated articles appearing in the Tamil blogger to match the contents of the English version. Nearly three years passed and to our satisfaction the Tamil blogger got well established. I still remember in one of the phone calls Manisha revealed that initially when she decided to commence the Tamil blogger, she was discouraged by her friends stating that the new venture may not last long. But Manisha’s determination prevailed over their fears due to her faith on Sai. She left everything on the shoulder of Sai himself and commenced the journey with my translated articles, though we never knew each other and communicated only by net. Later some months, she would often comment that it was the previous birth bond that brought us close to each other as ordained by Sai Baba. It was his game plan, she would happily express. I was amazed to see the extent of her abundant faith on Sai Maharaj. Truly she must be a blessed soul of Baba, lest her adventure would have been a fiasco for having reposed faith on a retired person of my sort, who was totally a stranger and opened up a Tamil site! Amazing is word short for her determination and faith. As the years passed, Baba's work bought a close bond , she become member of our family, and at one point of time my morale fell low due to several personal problems and I realized that I was mismatch to her speed and zeal in publishing Baba’s work and quietly started looking for a shadow to replace me. As blessing in disguise, at the end of 2011, Shri Sankarkumar, a doctor by profession from U.S, voluntarily came forward to offer his services for the same noble cause, and I wasted no time in netting him. 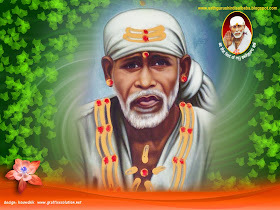 At that time I never realized that he was indeed a gold mine sent by Sai himself to propagate his leelas. Divine always act in blitzkrieg, so was Sai by sending Shi Sankarkumar at an appropriate time for unknown cause. Folowed Shri. Sankarkumar soon Mrs Ramya, also a house wife from U.S joined our team by offering her service. Soon I found her in no way lagging in any aspect and was freely able to run back with us!! Thus a team of three worked together to translate the Sai services into Tamil, still limping to match Manisha’s blogger. All of us interacted only through net with Manisha kept informed of their services time and again. The translated work in Tamil creped into the Sai blogger, and one fine morning Shri Sankarkumar called me up on telephone expressing desire to meet me in person when he visited Bangalore. I had no hesitation in meeting him and when we met, I was surprised to find that though he too was as old as me, much attached with Tamil and aggressive in futuristic thoughts on this blogger than my shelled views. We talked on several subjects and in the midst of discussion he explained in brief the significance of ‘Rama Vijaya’ and desired to translate the work in Tamil for the Sai Blogger if I agreed. Who am I to agree when Sai desired something of that sort and quite possibly Shri Sankarkumar would have been sent for such a cause to happen? However, propriety demanded that I contact Manisha to seek her approval as the site was hers and she happily agreed to the proposal in no time by shooting back the mail of acceptance, but with a rider as request. It should be simultaneously published in English version too commencing from Rama Navami. Sai Baba’s grace has been experienced by many, some of which remained personal to some but not revealed to others for inexplicable reasons. Though Sai was an ocean of grace, it is not difficult to reach him as it is not like climbing on Himalayas. He is omnipresent and radiates his grace of special kind through some medium, as is presently witnessed through the publication of Rama Vijaya. I must unhesitatingly mention on record, with heartfelt happiness that this sacred book ‘Rama Vijaya’ to our knowledge has not been published in any blogger or website in any language till now. Kudos to both Manisha and Shri Sankarkumar for reaching out this Sacred book to Baba’s devotees around the world.I am happy that I played the part of a squirrel between Manisha and Sankarkumar who is gold from the gold mine in getting this sacred book translated for the benefit of wider audience through Manisha’s Blogger. I hope I may be allowed to interject here a deeply felt tribute to both of them for this wonderful act, which will bestow ocean of happiness to true Sai devotees, especially to that of Tamil origin around the world, which is fascinating and believable in its own right. I take privilege to nickname Shri Sankarkumar as ‘Saisanku’ i.e ‘Sai+ Sankarkumar’. Sanku means Conch. Since he played the part of a conch in propagating the ideals of Shirdi Sai Baba he deserves to be nicknamed as ‘Saisanku’.May Sai bless Manisha, Ramya and Shri. Sankarkumar for continuing their journey by propagating the hereto unknown treasures of Shirdi Sai Baba, in the same manner and zeal as they have rightly done now. In the coming years let us all hope that we get more such treasures in the Sai sites of Manisha through ‘Saisanku’ and Baba willing more and more dark horses which may emerge at appropriate time . ‘Men may come and men may go, but the river flows on for ever’ is the best message one can give for Manisha’s Sai service blogger in Tamil. My best wishes to her in all her endeavors. Wonderful!! Amazing work done by all of you. Thank you and congratulations for you guys for had done such an divine work with the blessings of baba. Of course he is the doer and controller. Ram Vijaya has become a part of life. Daily morning when ever I sit in front of system, my mind first goes to this blog to read the next chapter. Even I had started 14 days pranayan of the same but now I would like to restart it by dividing the chapters like our SSC pranayan. Once again thankyou Mr.SaiShanku, Mr.N.R, Manisha didi, ramya didi and other co-supporters for your wonderful work completion. Lots of baba devotees are blessed to read this wonderful divine epic. One more thing I would like to mention that after Ram Vijaya start on Ram Navami, I have started to read the same in the temple which is located near to my home, where lots of children, old age people are interested to listen daily chapter wise. I thank baba for this opportunity. I pray him that the service must go on without any hurdles or obstacles in between. Very happy to learn that you have taken this to your local folks which is really commendable. Thank you very much for your kind words. As you had rightly said, BABA Himself has made this happen! Sairam. Thank you sir. Ofcourse BABA who made me to take this divine book to our local folks. When it will be published in pdf format, I hope it will be very much easy to carry on the process. Hope BABA will give it soon. Thank you sir for the amazing work done by you.I am on complete bed due to I'll health for months.I am in complete grief both physically and mentally till few days back and reading this great epic I personally feel relief and change in my life. Thanking you from the bottom of my heart.